Michael "Mickey" Pickett took down the WSOP-C event at the Rincon on Thursday, outlasting a tough final table and capturing a first place prize of $229k. 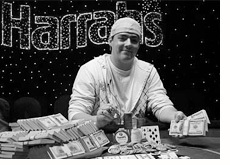 The final table was loaded with top-notch talent, including the likes of Gavin Smith and Lee Watkinson. Pickett entered the final table with a stack of just 121,000, well off the chipleader who had 854,000 heading into the final day of play (Edward Sabat). The first big elimination of the day was Lee Watkinson. He was eliminated in seventh place by Gavin Smith, after the two got all of their chips in the middle with Watkinson holding pocket fours and Smith holding pocket tens. Smith however was the next one out the door, as he was eliminated in sixth place after he pushed all-in holding Q-10 and was called by the A-J of Kenny Bedoya. The flop brought an ace and Smith was drawing dead to a Jack or runner-runner trip tens (Queen would have made Bedoya's straight), but the turn and river were no help and he was eliminated. Pickett started to surge after getting involved in a big hand with Kenny Bedoya. All of the chips moved into the middle on a board of 7-6-Q-5, with Pickett holding 8-4 for the straight and Bedoya holding just a pair of Queens. Bedoya was drawing dead and was eliminated in fourth place, giving Pickett the huge pot. The final hand came down when David Peters and Pickett got all-in on a board of 3-9-A-7-J, with Peters holding J-9 for two pair and Pickett holding 8-10 for the nut straight. This was Michael Pickett's first major tournament victory in a live setting.